Although much progress has been made in elucidating the biochemical properties of lipid rafts, there has been less success in identifying these structures within living cell membranes, which has led to some concern regarding their existence. One difficulty in analyzing lipid rafts using optical microscopy is their small size. We now test the existence of lipid rafts in polarized neutrophils, which redistribute lipid raft markers into comparatively large lamellipodia. Optical microspectrophotometry of Laurdan-labeled neutrophils revealed a large blue shift at lamellipodia relative to cell bodies. This blue shift disappeared after exposure to methyl-β-cyclodextrin (mβCD), which disrupts lipid rafts. The Ca2+ channel transient receptor potential-like channel-1, a lipid raft marker, traffics to lamellipodia, but redistributes uniformly about cells after exposure to mβCD. This is accompanied by disruption of Ca2+ waves normally initiated at lamellipodia. Thus, mβCD-sensitive lipid-ordered domains are present at and participate in signaling from the lamellipodia of living neutrophils. Lipid rafts are believed to be small (∼50-nm) membrane microdomains rich in cholesterol and sphingolipids. Due to the high degree of saturated fatty acyl substitution in these sphingolipids, lipid rafts are thought to form a distinct gel-like ordered lipid (Lo)3 phase within cell membranes. These domains have also been reported to be enriched in a variety of membrane proteins, especially GPI-linked proteins (1, 2, 3, 4). The cytoplasmic face of lipid rafts is thought to be enriched in a variety of signaling molecules. These molecules, in turn, may participate in certain signaling pathways of T cells, B cells, and mast cells (1, 2, 3, 4). However, these conclusions are based largely on fractionated cell components isolated by differential detergent ultracentrifugation. To deflect concerns regarding potential artifacts of cell fractionation, methyl-β-cyclodextrin (mβCD) is frequently used, because it binds to cholesterol and thereby disrupts lipid rafts in plasma membranes (5, 6). Because mβCD treatment provides no direct structural information regarding lipid rafts, it would be useful to have an independent means of verifying and studying lipid rafts in cell membranes. Recently, the fluorescent probe Laurdan has been used to study lipid raft-like phase separations in artificial lipid bilayers (7), although these are not necessarily representative of living cells. Because lipid rafts in cell membranes are ∼50–100 nm in size, which is much smaller than the wavelength of light, their analysis has been very limited. However, morphologically polarized cells display large aggregates of lipid raft markers in the region of the lamellipodium (8, 9). Thus, we have used polarized neutrophils to circumvent the size difficulties encountered in studying lipid rafts in living cells. Using the lipid probe Laurdan in conjunction with an imaging monochrometer-based microscope system, we have observed dramatic changes in the spectral properties of Laurdan at a cell’s lamellipodium, indicating a distinct lipid-ordered structure at the leading edge of intact, living human neutrophils. This lipid raft-like structure disappears after treatment with mβCD. This is also the site of Ca2+ wave ignition in polarized neutrophils (10), and propagation of these Ca2+ waves is abrogated by mβCD. Thus, the existence of large lipid raft-like domains participating in Ca2+ signaling can be directly observed in living polarized neutrophils. A polyclonal rabbit anti-transient receptor potential-like channel-1 (TRPC-1) Ab was purchased from Chemicon International (Temecula, CA). Anti-GM3 was purchased from Seigagaku America (East Falmouth, MA). Laurdan (6-dodecanoyl-2-dimethylaminonaphthalene) was obtained from Molecular Probes (Eugene, OR). mβCD was obtained from Sigma-Aldrich (St. Louis, MO). Neutrophils were isolated from blood samples using Ficoll-Hypaque (Sigma-Aldrich) density gradient centrifugation (10). Neutrophil viability was >95% as assessed by trypan blue exclusion. Cells were suspended in HBSS (Life Technologies, Grand Island, NY). For Ca2+ studies, cells were prelabeled with indo-1-AM at 5 μg/ml for 20 min at 37°C (10). The value of n given below is the number of days an experiment was repeated, with at least 50 cells evaluated for each condition. To disrupt lipid rafts, neutrophils were incubated with 5 mM mβCD for 5 min at 37°C as described (11). Cells were observed using an axiovert fluorescence microscope (Carl Zeiss, New York, NY) (10). A narrow bandpass filter set (Omega Optical, Brattleboro, VT) was used with excitation at 485/22 nm and emission at 530/30 nm for FITC, and an excitation of 540/20 nm and emission at 590/30 nm for tetramethylrhodamine isothiocyanate. Long-pass dichroic mirrors of 510 and 560 nm were used for FITC and tetramethylrhodamine isothiocyanate, respectively. The fluorescence images were collected with an intensified charge-coupled device camera (Princeton Instruments, Princeton, NJ). To study membrane phase properties, the fluorescent probe Laurdan, which shows a significant shift to shorter emission wavelengths (blue shift) in gel phase relative to liquid crystalline membranes (7), was used. However, if the surrounding lipid molecules move during its fluorescence lifetime, Laurdan’s excited state dipole will reorient neighboring molecules, and a red shift in its steady-state emission spectrum will be observed. Laurdan emission spectra were collected from specific regions of single cells using an imaging spectrophotomer system. Cells were labeled with 2.5 μM Laurdan for 25 min at room temperature and then washed at least three times with buffer. To increase light collection efficiency, the microscope’s bottom port was fiber-optically coupled to the input side of an Acton-150 (Acton Instruments, Acton, MA) imaging spectrophotometer. The exit side was connected to a liquid N2-cooled intensifier attached to a Peltier-cooled I-MAX-512 camera (approximately −20°C) (Princeton Instruments) (12, 13). The camera was controlled by a high-speed Princeton ST-133 interface and a Stanford Research Systems (Sunnyvale, CA) DG-535 delay gate generator. Microspectrophotometry used a 355-nm band-pass discriminating filter for excitation and a 405-nm long-pass dichroic mirror. Winspec software (Princeton Instruments) was used to analyze data. High-speed microscopy was performed as previously described (10). To detect fluorescence changes in the short wavelength emission region of indo-1, a 355HT15 exciter, a 390LP dichroic reflector, and a 405DF43 emission filter were used. A Gen-II intensifier tube was used to provide maximal detector efficiency at indo-1’s emission. For data management, a computer with dual 3.06-GHz xenon processors with 1-MB onboard cache each, 3.0-Gb RAM, and 3.2 Tb of hard drive space, was used. For data capture, a software-allocated RAM disk was used. Several previous studies have shown that the lamellipodia of lymphocytes are enriched in lipid raft markers (8, 9). Therefore, we first confirmed that lipid raft markers accumulate at the lamellipodium of neutrophils. When adherent to coverslips, 26 ± 5% of the cells become polarized spontaneously. Neutrophils were labeled with anti-GM3 Ab. Representative micrographs are shown in Fig. 1⇓. Although spherical cells did not display large clusters of GM3, 92 ± 6% of the polarized cells exhibited large aggregates of GM3 at lamellipodia (Fig. 1⇓B). Similarly, the Ca2+ channel TRPC-1, which also cofractionates with lipid rafts (14), collects at lamellipodia of polarized cells (94 ± 5%) (Fig. 1⇓F). Previous studies (15) have shown that uPAR, a GPI-anchored protein, which associates with lipid rafts, also collects at lamellipodia. Therefore, the neutrophil lamellipodium is highly enriched in lipid raft markers. Previous studies have shown that lipid rafts can be disrupted by mβCD, which abstracts cholesterol from cell membranes (5, 6). Cells were exposed to 5 mM mβCD for 5 min at 37°C followed by immunofluorescence microscopy. Although morphologically polarized neutrophils were observed after mβCD treatment (Fig. 1⇓, C and G), GM3 (D) and TRPC-1 (H) did not traffic to the lamellipodium of treated cells; enriched labeling of the lamellipodium was noted in only 13 ± 2 and 8 ± 3% of the cells, respectively. Thus, lipid raft markers collect at the lamellipodia of polarized cells in an mβCD-sensitive fashion. Accumulation of lipid raft markers at neutrophil lamellipodia. Cells were labeled with anti-GM3, a lipid raft ganglioside marker (A–D) and TRPC-1, a Ca2+ channel associated with lipid rafts (E–H). Cells were examined without (A, B, E, and F) and with (C, D, G, and H) prior exposure to 5 mM mβCD for 5 min at 37°C. GM3 and TRPC-1 trafficked to the lamellipodium of polarized neutrophils, but not on spherical cells (B and F). However, exposure to mβCD blocked the ability of these molecules to accumulate at the lamellipodium (D and H). n = 4. Having demonstrated that lamellipodia possess lipid raft markers, we next sought to test the hypothesis that these domains represent a distinct lipid environment. Although Lo phase lipids have been observed in reconstituted lipid rafts using Laurdan (7), they have not been demonstrated in living cells. One key reason for this is that lipid rafts are often smaller than the wavelength of light, making identification of Lo phase rafts difficult. As shown in Fig. 1⇑, morphologically polarized neutrophils display ganglioside-enriched lipid raft-like regions at the lamellipodium. To test for differences in membrane fluidity in different regions of cells, neutrophils were labeled with Laurdan (16). In fluid membranes, Laurdan exhibits a red shift in its steady-state emission spectrum compared with gel phase membranes. Using high-sensitivity microspectrophotometry, we collected emission spectra from the lamellipodia, uropods, and the lateral cell body surfaces of morphologically polarized neutrophils. Although the emission spectra of spherical cells did not differ from those of the lateral cell body surfaces (p > 0.3), the lamellipodia were blue-shifted in comparison to spherical cells (Fig. 2⇓), indicating that these regions are less fluid than other membrane regions. The peak was shifted by >12 nm (p < 0.001). Similar observations were noted for the uropod (data not shown). The blue shift of Laurdan in the lamellipodium is one of the most pronounced spectral shifts (i.e., least fluid) reported for Laurdan or prodan in biological membranes. These studies provide direct evidence in living cells for the presence of Lo phase domains, which spatially correspond to ganglioside-enriched domains and lipid rafts as defined by cell fractionation. Demonstration of lipid domains in neutrophil membranes. Cells were labeled with Laurdan, which undergoes a red shift in fluid membranes. Data from polarized cells were collected exclusively from the lamellipodium (lamel. ), uropod, and the lateral aspects of the cell body. Data from spherical cells were collected from the entire cell. 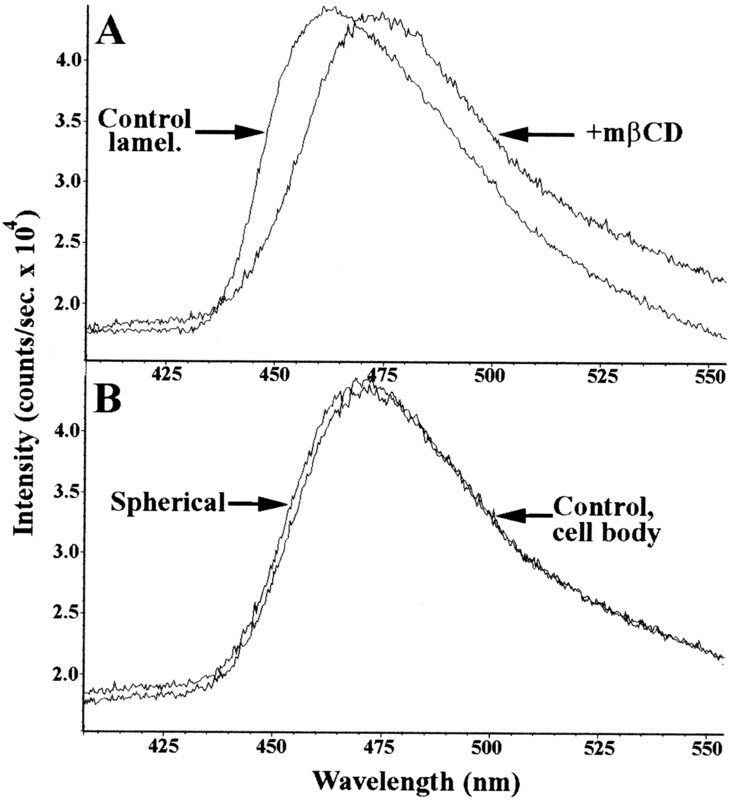 The emission spectrum of Laurdan from the lamellipodium in controls (A) is dramatically shifted in comparison to the cell body of controls (B) and spherical cells (B), and that of mβCD-treated lamellipodia (A). Thus, the lamellipodium is substantially more rigid than other domains of the neutrophil plasma membrane. n = 4. Having established the presence of Lo phase lipids in living cell membranes, we next sought to test the ability of mβCD to influence these lipid domains. Although mβCD affects the recovery of cold detergent-resistant membrane fractions, whether or not artifacts of detergent solubilization contribute to these observations cannot be resolved without confirmatory cell biology evidence. We found that morphologically polarized neutrophils remained polarized after treatment with 5 mM mβCD. We therefore examined mβCD-treated cells using Laurdan. We found no significant differences between the Laurdan emission spectra of spherical neutrophils and morphologically polarized neutrophils examined at the lamellipodium, lateral surfaces, and uropod (Fig. 2⇑). Thus, the Lo phase lipid domains disappear from the lamellipodium and uropod upon exposure to mβCD. These experiments provide novel insights into the structural organization of lipid domains and further support the identification of Lo domains as GM3-rich lipid rafts. Early studies by Maxfield and coworker (17) showed that polarized neutrophils display intracellular Ca2+ spikes at regular intervals, and we have replicated this finding in our laboratory (e.g., Ref. 10). Neutrophils were labeled with the Ca2+-sensitive dye indo-1-AM, as described (10). 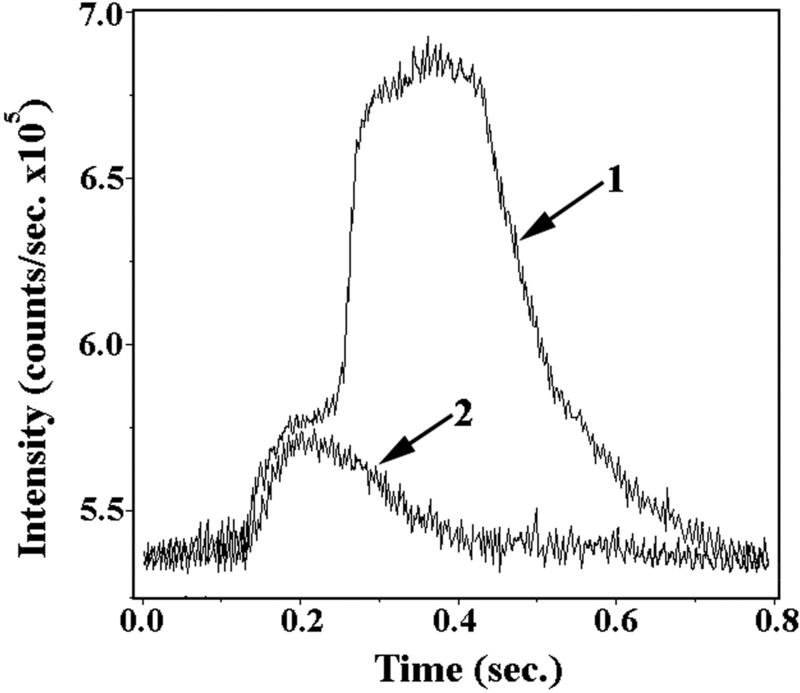 When these cells were observed using quantitative microfluorometry, a series of Ca2+ spikes were found (Fig. 3⇓A). A recent study has suggested that mβCD affects Ca2+ signaling in neutrophils (5). When morphologically polarized mβCD-treated neutrophils were examined, a much smaller Ca2+ bump was observed (Fig. 3⇓B). The time base of these experiments is very long (6 min), which gives only a few pixels per spike. To obtain high temporal resolution data, experiments were performed for <1 s (Fig. 4⇓). These experiments reveal the fine structure of these Ca2+ signals. The Ca2+ bump appears to correspond to a shoulder at the leading edge of the Ca2+ signal, which we interpret to be the ignition of the Ca2+ signal. Thus, the Lo domain, which apparently contains important Ca2+ signaling machinery such as TRPC-1, appears to be necessary to generate Ca2+ signaling in morphologically polarized neutrophils. Low-temporal resolution microfluorometry studies of neutrophil Ca2+ spikes. Photomultiplier tube recordings of Ca2+ signals were made in untreated (A) and mβCD-treated (B) polarized neutrophils. Note the dramatic decrease in the amplitude of the Ca2+ signal. Data were recorded for 6 min. n = 3. High temporal resolution microfluorometry studies of neutrophil Ca2+ spikes. Photomultiplier tube recordings of Ca2+ signals were made in untreated (trace 1) and mβCD-treated (trace 2) polarized neutrophils. The amplitude of the Ca2+ signal is dramatically decreased. The Ca2+ bump of mβCD-treated cells appears to correspond to an initial shoulder of the Ca2+ spike, which we interpret as the ignition of the Ca2+ signal. Data were recorded for 0.8 s. n = 3. We have recently developed high-speed optical microscopy, which allows us to detect chemical signals within small cells with unprecedented detail (10, 12, 13). A previous high-speed microscopy study from this laboratory showed that each repetitive Ca2+ spike corresponded to a Ca2+ wave traveling around the neutrophil’s periphery (10). We therefore sought to test the concept that the lamellipodium plays a central role in Ca2+ signaling in an mβCD-sensitive fashion. Fig. 5⇓A shows an example of the traveling Ca2+ wave in an untreated cell. However, after treatment with mβCD, only a brief Ca2+ spark is observed (Fig. 5⇓B, arrow), which is the imaging equivalent of the bump detected with microfluorometry. The advantage of this approach is that we can see that the signaling is disrupted at the lamellipodium of polarized neutrophils. We speculate that mβCD treatment uncouples the intracellular Ca2+ signaling apparatus (ignition) from the plasma membrane-bound signaling apparatus (propagation). mβCD inhibits Ca2+ wave propagation in neutrophils. A, A Ca2+ wave traveling about the perimeter of untreated cells is shown. B, Shown is a brief Ca2+ spark (arrow) in the same cell after 5-min exposure to mβCD, without subsequent propagation of the Ca2+ wave. n = 3. The present study provides strong direct evidence for the existence of a lipid raft-like Lo domain at the lamellipodium of polarized neutrophils. The formation of lipid raft-like structures has been previously noted for polarized lymphocytes (8, 9). The neutrophil’s lamellipodium contains lipid raft markers such as GPI-linked proteins (1, 2, 3, 4, 5, 6, 15), GM3 (Fig. 1⇑B), and TRPC-1 (F). However, it is also possible that these molecules are delivered to the lamellipodium by a mechanism distinct from lipid raft formation. Furthermore, although certain components may be identified in lipid rafts on the basis of cell fractionation and ultracentrifugation, it is always possible that an artifact might be introduced during isolation procedures. Therefore, we sought to confirm the presence of lipid rafts using an independent approach using intact cells. Although previous studies have used the membrane probe Laurdan to examine the fluidity of neutrophil membranes (16), these experiments did not provide spatially resolved spectral information at the single-cell level and therefore do not address lateral variations in lipid properties. Using imaging spectroscopy, we now show that Laurdan undergoes a dramatic blue shift at the lamellipodium, indicating that this region represents a highly ordered lipid domain. Because the lamellipodium is several micrometers in size, we avoid the difficulties inherent in obtaining spatially resolved information from lipid rafts. Our data clearly show that Laurdan samples a more ordered environment at the lamellipodium than at other locations about the cell. While this manuscript was in preparation, a study was reported using Laurdan in conjunction with other methods to examine spatially resolved domains on another cell type (18). These emerging studies of lipid domains and their spatial identity with lipid raft markers in living cells gives renewed confidence in the existence of these structures. One crucial function of lipid rafts is believed to be their ability to serve as signaling platforms (1, 2, 3, 4, 5, 6). Cholesterol-rich lipid rafts have recently been suggested to participate in neutrophil Ca2+ signaling (5). 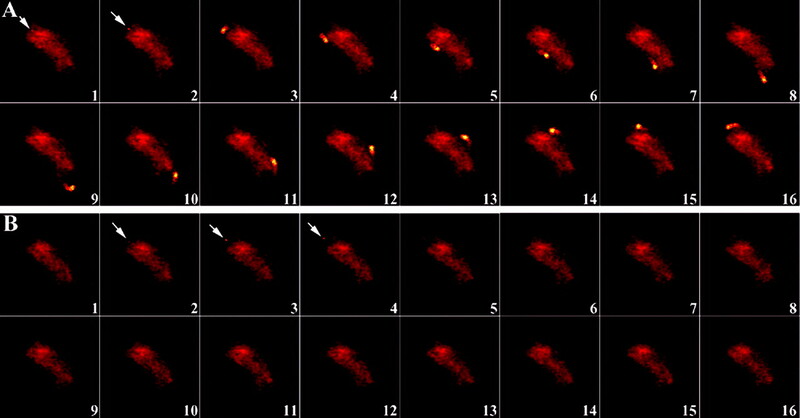 Using previously established quantitative microfluorometry and high-speed fluorescence microscopy methods, we have studied the Ca2+ signaling events associated with spontaneous neutrophil motility. Using an efficient optical system and photodetector capable of sensing single atoms, we have been able to achieve electronic shutter speeds of ∼0.1 μs, which allows us to follow the intracellular trafficking of intracellular signals (10, 12, 13). Our recent study (10) and the experiments described above indicate that the plasma membrane component of this signal originates at the lipid raft-like lamellipodium. Thus, high-speed microscopy allows us to definitively establish the lipid raft as the source of the plasma membrane signal. To further support this conclusion, cells were studied after mβCD treatment. Exposure to mβCD dramatically reduced signal amplitude and its associated plasma membrane Ca2+ wave. Because lipid raft-associated TRPC-1 is a type of store-operated Ca2+ channel (SOC) and SOCs have been implicated in neutrophil raft signaling, the TRPC-1 clusters at the lamellipodium and their dissolution by mβCD may explain the changes in Ca2+ signaling that we have observed. In a separate study, we have shown that SOC inhibitors block this Ca2+ wave.4 Our data provide strong cell biological evidence supporting the existence of lipid rafts in human neutrophils and that these rafts are intimately associated with the Ca2+ signaling apparatus. This signaling apparatus appears to be linked with downstream processes, such as NADPH oxidase efficiency (19) and cell motility (20). ↵1 This research was supported by CA074120 (to H.R.P.) and HL58283 (to R.G.S.). ↵3 Abbreviations used in this paper: Lo, ordered lipid; mβCD, methyl-β-cyclodextrin; SOC, store-operated Ca2+ channel; TRPC-1, transient receptor potential-like channel-1. ↵4 A. Kindzelskii and H. Petty. Ion channel clustering enhances weak electric field detection by neutrophils: apparent role of SKE96365-sensitive cation channels in early events. Submitted for publication. Dykstra, M., A. Cherukuri, H. W. Sohn, S. J. Tzeng, S. K. Pierce. 2003. Location is everything: lipid rafts and immune cell signaling. Annu. Rev. Immunol. 21:457. Simons, K., D. Toomre. 2000. Lipid rafts and signal transduction. Nat. Rev. Mol. Cell Biol. 1:31. Pike, L. J.. 2003. Lipid rafts: bringing order to chaos. J. Lipid Res. 44:655. Ilangumaran, S., D. C. Hoessli. 1998. Effects of cholesterol depletion by cyclodextrin on the sphingolipid microdomains of the plasma membrane. Biochem. J. 335:433. Barabe, F., G. Pare, M. J. Fernandes, S. G. Bourgoin, P. H. Naccache. 2002. Cholesterol-modulating agents selectively inhibit calcium influx induced by chemoattractants in human neutrophils. J. Biol. Chem. 277:13473. Dykstra, M., A. Cherukuri, S. K. Pierce. 2001. Rafts and synapses in the spatial organization of immune cell signaling receptors. J. Leukocyte Biol. 70:699. Dietrich, C., L. A. Bagatolli, Z. N. Volovyk, N. L. Thompson, M. Levi, K. Jacobson, E. Gratton. 2001. Lipid rafts reconstituted in model membranes. Biophys. J. 80:1417. Manes, S., E. Mira, C. Gomez-Mouton, R. A. Lacalle, P. Keller, J. P. Labrador, C. Martinez-A. 1999. Membrane raft microdomains mediate front-rear polarity in migrating cells. EMBO J. 18:6211. Gomez-Mouton, C., J. L. Abad, E. Mira, R. A. Lacalle, E. Gallardo, S. Jimenez-Baranda, I. Illa, A. Bernad, S. Manes, C. Martinez-A. 2001. Segregation of leading-edge and uropod components into specific lipid rafts during T cell polarization. Proc. Natl. Acad. Sci. USA 98:9642. Kindzelskii, A. L., H. R. Petty. 2003. Intracellular calcium waves accompany neutrophil polarization, formylmethionylleucylphenylalanine stimulation, and phagocytosis: a high speed microscopy study. J. Immunol. 170:64. Sitrin, R. G., D. R. Johnson, P. M. Pan, D. M. Harsh, J. Huang, H. R. Petty, R. A. Blackwood. 2004. Lipid raft compartmentalization of urokinase receptor signaling in human neutrophils. Am. J. Respir. Cell Mol. Biol. 30:233. Worth, R. G., M.-K. Kim, A. L. Kindzelskii, H. R. Petty, A. D. Schreiber. 2003. Signal sequence within FcγRIIA controls calcium wave propagation patterns: apparent role in phagolysosome fusion. Proc. Natl. Acad. Sci. USA 100:4533. Kindzelskii, A. L., H. R. Petty. 2002. Apparent role of traveling metabolic waves in periodic oxidant release by living cells. Proc. Natl. Acad. Sci. USA 99:9207. Lockwich, T. P., X. Liu, B. B. Singh, J. Jadlowiec, S. Weiland, I. S. Ambudkar. 2000. Assembly of Trp1 in a signaling complex associated with caveolin-scaffolding lipid raft domains. J. Biol. Chem. 275:11934. Kindzelskii, A. L., M. M. Eszes, R. F. Todd, H. R. Petty. 1997. Proximity oscillations of complement type 4 (αX β2) and urokinase receptors on migrating neutrophils. Biophys. J. 73:1777. Fiorini, R., G. Curatola, A. Kantar, P. L. Giorgi, E. Gratton. 1993. Use of Laurdan fluorescence in studying plasma membrane organization of polymorphonuclear leukocytes during the respiratory burst. Photochem. Photobiol. 57:438. Marks, P. W., F. R. Maxfield. 1990. Transient increases in cytosolic free calcium appear to be required for the migration of adherent human neutrophils. J. Cell Biol. 110:43. Gaus, K., E. Gratton, E. P. W. Kable, A. S. Jones, I. Gelissen, L. Kritharides, W. Jessup. 2003. Visualizing lipid structure and raft domains in living cells with two-photon microscopy. Proc. Natl. Acad. Sci. USA 100:15554. Shao, D., A. W. Segal, L. V. Dekker. 2003. Lipid rafts determine efficiency of NADPH oxidase activation in neutrophils. FEBS Lett. 550:101. Millan, J., M. C. Montoya, D. Sancho, F. Sanchez-Madrid, M. A. Alonso. 2002. Lipid rafts mediate biosynthetic transport to the T lymphocyte uropod subdomain and are necessary for uropod integrity and function. Blood 99:978.